Scott Morrison is taking over a bruised and battered federal government but he's promising sceptical Australians "we are on your side". He lined up drought, electricity prices, chronic illness healthcare and economic management as his immediate priorities as the incoming prime minister. 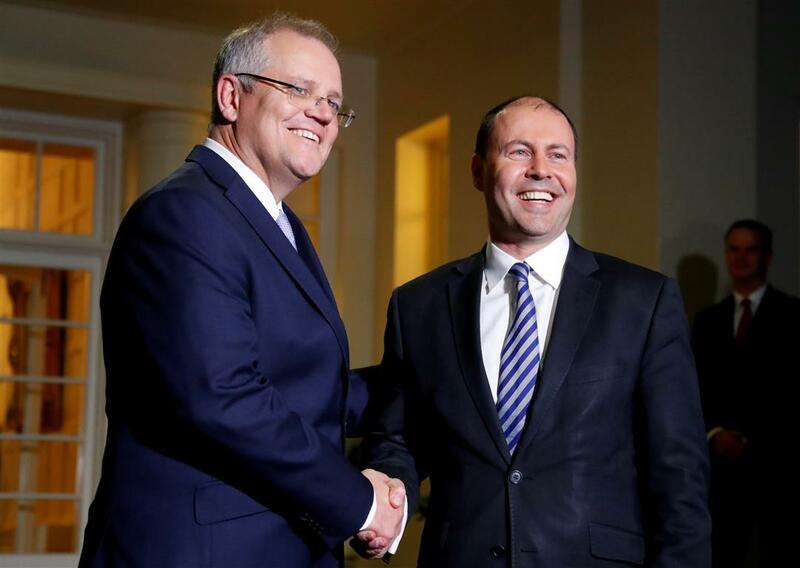 "There has been a lot of talk this week about whose side people are on in this building," Mr Morrison said while standing next to his new deputy leader Josh Frydenberg in Canberra on Friday. It came after an embarrassing week for the nation, which has its fifth prime minister in just over five years. "The last week has been about us and from here on, it is about the Australian people," incoming treasurer Mr Frydenberg said. Mr Morrison was officially sworn in as Australia's 30th prime minister on Friday night in a ceremony at Government House in Canberra. He won the ballot to replace Malcolm Turnbull in a Liberal party meeting on Friday, defeating Peter Dutton 45 votes to 40. Mr Turnbull farewelled the top job with a sunny smile and relieved expression, but he lashed out at the men who destabilised the party. "Peter Dutton and Tony Abbott and others who chose to deliberately attack the government from within, they did so because they wanted to bring the government down," Mr Turnbull told reporters. The Wentworth MP will leave parliament "soon", potentially handing Mr Morrison a by-election to deal with and - if the seat is lost - a hung parliament. But Mr Morrison said he looked forward to any campaign, while also ruling out an early general election. For his part, Mr Dutton said he would now be loyal to Mr Morrison. "I only nominated because I believe that I was a better person and a person of greater strength and integrity to lead the Liberal Party," Mr Dutton told the ABC. The leadership contest started with a dispute over energy policy, and while Mr Morrison promised to keep prices down, he did not commit to sticking with the National Energy Guarantee. Mr Turnbull tried to short circuit the leadership tension with a snap ballot on Tuesday, which he won 48 votes to 35. But when it became clear Mr Dutton wanted a second challenge, Mr Turnbull called a meeting for Friday to give Mr Morrison and Julie Bishop time to do their own numbers. The spill motion at the meeting only passed 45-40, meaning Mr Turnbull would have needed just three votes to swing his way to stay on as prime minister. Ms Bishop lost out in the first three-way contest for the leadership and did not stand again as deputy leader, but Mr Morrison indicated she could stay on in the ministry. Former prime minister Mr Abbott told reporters the job now was to "save the government". "We have lost the prime minister but there is still a government to save," he said. Labor leader Bill Shorten praised Mr Turnbull, the man who beat him at the 2016 election, for his love of his family and his country. "I don't think any Australian prime minister has used the word 'love' more frequently in his public remarks," Mr Shorten said in a statement.